How could Shrek's friends arrive so quickly? When Shrek and Fiona travel to "Far Far Away" in Shrek 2, the travel scene is portrayed as a very long one, because, well, they do travel "far far away". Before leaving his swamp, Shrek hands it over to gingerbread man, three piggies, Pinocchio and others to "guard". Later on, gingerbread man recognizes Shrek when watching "TV" and the whole group is able to help him in a matter of hours. This sounds like a plot hole to me. Or is there any explanation of how they could arrive to help him so quickly? 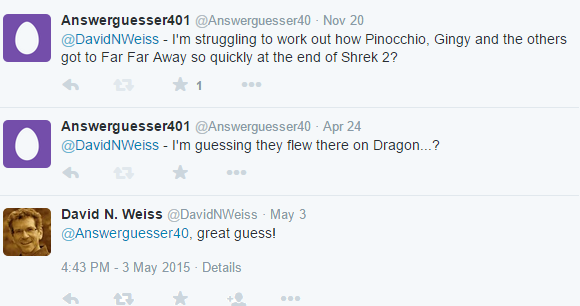 I asked the film's screenwriter, David N Weiss. He confirmed that they flew to Far Far Away on Dragon. It might also interest you to know that at that point in the film, Dragon may have been in the form of a Pegasus as a result of the "Happily Ever After Potion". Not the answer you're looking for? Browse other questions tagged plot-explanation shrek-2 . Who shot Lt. Smith (Wesley Snipes) in the back? Why did it take the Cops so long to arrive? How did Jack get to the island, and how did he become so important so quickly? How did Rio know so quickly who robbed the store?